Hi everyone I just wanted to make a quick post and let you know that I am Guest Posting over at Scarlet Threads today. I hope you can pop over and check out my post. Since Christmas is only days away I am sharing my favorite Sugar Cookie Recipe. These are the cookies that the kids and I bake every year on Christmas Eve for Santa. Do you bake a special cookie that leave out for Santa Clause? If you are not familiar with Scarlet Threads please stay a bit and visit their beautiful boutique. It is filled with all sorts of wonderful items. Aprons, tree skirts, purses and hand sewn tiger hats. All of the products for sale are created by talented seamstresses in Asia earning a steady source of income for their families. When you purchase one of their beautiful hand-crafted products, you become part of their story by providing a woman with safe and rewarding work. 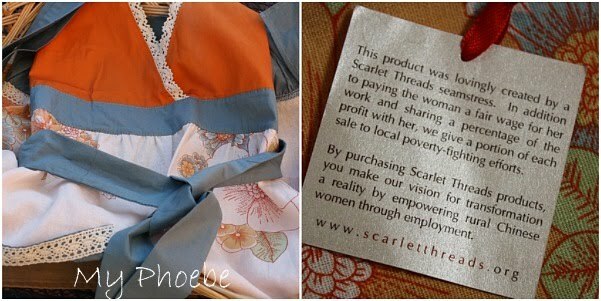 I have included a photo above of my first apron purchase from Scarlet Threads. I was so excited when my (Phoebe) finally arrived in the mail. The detail and hard work really shows through in this beautiful apron. I wear it proudly knowing that a part of my apron purchase will go towards helping another woman, mother or family in need. Today I am also offering all my Mommy's Kitchen readers a 20% discount code good towards any purchase at Scarlet Threads. I can't wait to purchase my second apron. I am leaning towards a Aubergine or Kyra apron I still can't decide. There's nothing more classic then these cookies at Christmas--Happy Holidays to you, Tina!! My husband has been wanting to deep fry a turkey for several years. I'd love to have it for him. The shrimp boil sounds GREAT. I have some shrimp in the freezer just waiting to try the shrimp broil. I am sure we would find lots of other things to try. It looks good. I think it taste yummy and delicious. Everyone love cookies in new year's eve especially they say that circled things should be on your new years eve.